As you see in the lead photograph there are some good fish to be had offshore. That fish was one several Wahoo lately. That one is a really nice fish but on the overall big picture our fishing has become erratic . Mahi-Mahi fishing remains slow again this week with a bit of luck required to have much success there. Conditions have been good for the Mahi with a strong northerly current for several days and clean water offshore. Good amounts of seaweed holding a fair amount of bait, just a lack of Mahi-Mahi. 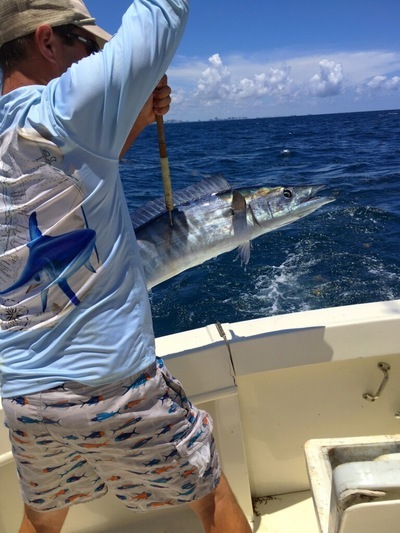 Some Kingfish continue to bite on the reefs in about 200 feet of water. To the south of our inlet has had the better action for them with the best bites coming cutting across the current, as it has been formidable and even remaining strong to the north even way up inside the reefs. Fishing down current has seemed like a NASCAR event with a slow presentation just not in the cards even with a single engine engaged and @ dead idle. We typically like to angle across the reefs anyway when trolling, just right now that angle is reduced. Still the Bonito passing through and the Blackfins enjoy the stronger current and we are seeing them slightly off the edge. Sails are scattered but always a possibility on or very near the reefs with the strong current. Amberjack available on wrecks with the spots south of us best, but that current comes into play once again there.